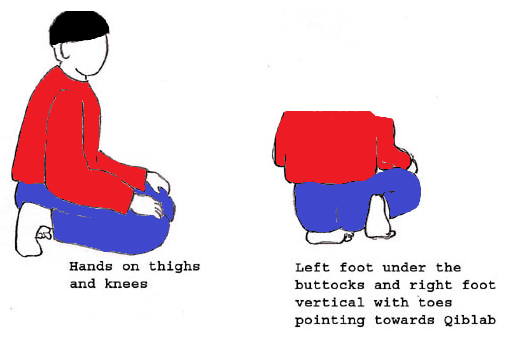 If possible, one should touch the ground with one’s knees before touching it with the hands. 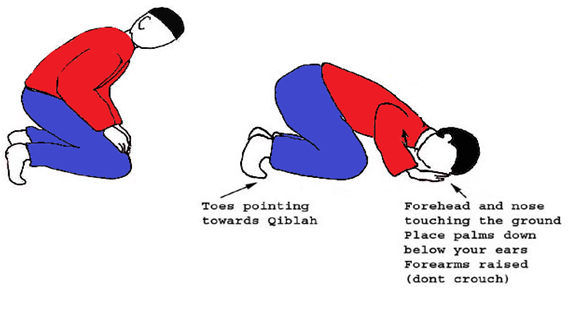 If not, it is permissible to touch the ground with the hands before the knees. The fingers and toes should be directed towards the qiblah (Makkah), and the hands should be stretched with the fingers close together and not separated. Which means: "Glorified is my Lord, the Exalted." The worshipper should ask his Lord for prosperity both in this worldly life and in the Hereafter. Whether it is an obligatory prayer or an optional prayer, the worshipper, while prostrating, should neither bring his hands close to his sides, nor stick his abdomen to his thighs, or his thighs to his legs. The left foot should be flat on the ground and one should sit on it, keeping the right foot erected. 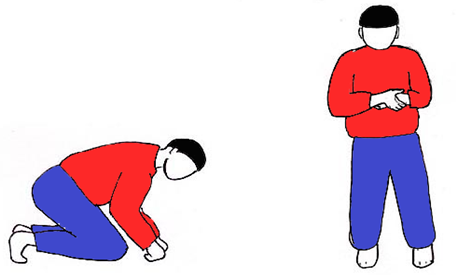 Prostrate again saying “Allahu Akbar” and repeat during the prostration what was done and said in the first prostration. It is recommended for the worshipper to do such a pause, but there is no sin if he desists from it. Then the worshipper rises up and stands supporting on one’s knees, or on the ground if one cannot support oneself on the knees. Then the Fatihah (the opening Surah of the glorious Quran) is read and some other verses of the Quran; you do as per the first Rakaah (unit of prayer). o The right foot should be erect, whilst sitting on the left foot which is laid down. o The right hand should be on the right thigh and the left hand is put on the left thigh. o All the fingers should be close-fisted except the index finger, which is used to point out as a sign for one’s monotheistic belief. o There is no harm if the worshipper keeps both the little and ring fingers closed, whilst rounding the thumb and middle finger in a ring-shape, and use the index finger to point out as a sign for the monotheistic belief. o It has been related that the Prophet (salaAllahu alayhi wa salam), had practiced both of these ways; thus, it is advisable for the worshipper to perform the first way once and the other on the second time. “Atahiyatu lilahi wasaalawatu wat-tayyibatu, Assalamu aluka ayuha-n-nabiyu wa rahmat-u-llahi wa barakatuhu. Assalamu alayina wa ala ibadi-l-lahi-s-salalihiyn - Ashadu an la ilaha ila lahu wa ashadu anna muhmmadam abdoho wa rasuwloh. “Greetings, prayers and the good things of life belong to Allah. Peace, mercy and blessings of Allah be upon you, O Prophet. May peace be upon us and on the devout slaves of Allah. I testify that there is no God but Allah and I testify that Muhammad is His slave and messenger. Allauma aoodhu bika min adhaabi jahannam, wa min adhaabil qabr wa min fitnatil mahya wal mamaat, wa min sharri fitnatil maseehul dajjal. My Lord, I ask your protection from: the torment of the Hell Fire, and from the torment of the grave and from the trials in life - both in this life and after death, and from the imposter Antichrist. The worshipper may ask Allah (subhanahu wa ta’ala) for prosperity in this worldly life and in the Hereafter, and supplicate to Allah (subhanahu wa ta’ala) to bestow His favors on his parents and other Muslims. -- He could do this in both obligatory and optional prayers. -- It has been reported by Ibn Masoud that the Prophet (salaAllahu alayhi wa salam), taught him how to recite the Tashahud and told him that the worshipper should invoke Allah (subhaanahu wa ta’ala) and ask Him for the more beloved wishes which he likes[vii], or, as it has been related in other wordings, the worshipper should ask Allah (subhaanahu wa ta’ala) for whatever he wishes. In this manner, the servant can ask Allah (subhaanahu wa ta’ala) for all the prosperities of this worldly life and the life to come. The worshipper, after reciting the Tashahud (only; Salatul Ibrahimiyya is not recited at this point) according to the manner stated before, then raises the hands up to the level of his shoulders saying “Allaahu Akbar”. The hands are then put over the chest as it had been explained before and only the Fatiha is recited. There is no objection, however, if some other verses of the Qur’an are recited after the Fatiha while performing the third or fourth rakaat of the Zuhur prayer, because this was stated to be one of the manners adopted by the Prophet (salaAllahu alayhi wa salam), according to the tradition reported by Abi Saied. the worshipper recites the Tashahud and terminates his prayer by saying: “As-salaamu alai kum wa rahmatu allah” while turning first to the right, and second to the left as it has been explained before. It is not an obligatory duty, but it is a recommendable prophetic tradition to invoke Allah (subhanahu wa ta’ala) after terminating the prayer. Allaahumma ‘Antas-Salaamu wa minkas-salaamu, tabaarakta yaa Thal-Jalaali wal-‘Ikraam. Laa ‘ilaaha ‘illallaahu wahdahu laa shareeka lahu, lahul-mulku, wa lahul-hamdu wa Huwa ‘alaa kulli shay ‘in Qadeer. Laa hawla wa laa quwwata ‘illaa billaahi, Allaahumma laa maani’a limaa ‘a’tayta, wa laa mu’tiya limaa mana’ta, wa laa yanfa’u thal-jaddi minkal-jadd. Laa ‘ilaaha ‘illallaahu, wa laa na’budu ‘illaa ‘iyyaahu, lahun-ni’matu wa lahul-fadhlu wa lahuth-thanaa’ul-hasanu, laa ‘ilaaha ‘illallaahu mukhliseena lahud-deena wa law karihal-kaafiroon. Laa ‘ilaaha ‘illallaahu wahdahu laa shareeka lahu, lahul-mulku wa lahul-hamdu waHuwa ‘alaa kulli shay’in Qadeer. There is no God but Allah. He is the One, He has no partner. His is the dominion and to Him alone is the praise; He has power over all things. "اللهُ لَا إِلَهَ إِلَّا هُوَ الْحَيُّ الْقَيُّومُ لَا تَأْخُذُهُ سِنَةٌ وَلَا نَوْمٌ لَهُ مَا فِي السَّمَاوَاتِ وَمَا فِي الْأَرْضِ مَنْ ذَا الَّذِي يَشْفَعُ عِنْدَهُ إِلَّا بِإِذْنِهِ يَعْلَمُ مَا بَيْنَ أَيْدِيهِمْ وَمَا خَلْفَهُمْ وَلَا يُحِيطُونَ بِشَيْءٍ مِنْ عِلْمِهِ إِلَّا بِمَا شَاءَ وَسِعَ كُرْسِيُّهُ السَّمَاوَاتِ وَالْأَرْضَ وَلَا يَئُودُهُ حِفْظُهُمَا وَهُوَ الْعَلِيُّ الْعَظِيمُ". Allaahu laa ‘ilaaha ‘illaa Huwal-Hayyul-Qayyoom, laa ta’khuthuhu sinatun wa laa nawm, lahu maa fis-samaawaati wa maafil-‘ardh, man thal-lathee yashfa’u ‘indahu ‘illaa bi’ithnih, ya'lamu maa bayna ‘aydeehim wa maa khalfahum, wa laa yuheetoona bishay’im-min ‘ilmihi ‘illaa bimaa shaa’a, wasi’a kursiyyuhus-samaawaati wal’ardh, wa laa ya’ooduhu hifdhuhumaa, wa Huwal-‘Aliyyul-‘Adheem. It is recommendable to recite these Surahs thrice after the Fajr prayer and the Maghrib prayer because this was reported to be one of the traditions of the Prophet (salaAllahu alayhi wa salam).